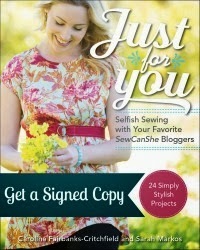 Blue Susan makes: Sewing Soiree Success + a Giveaway! 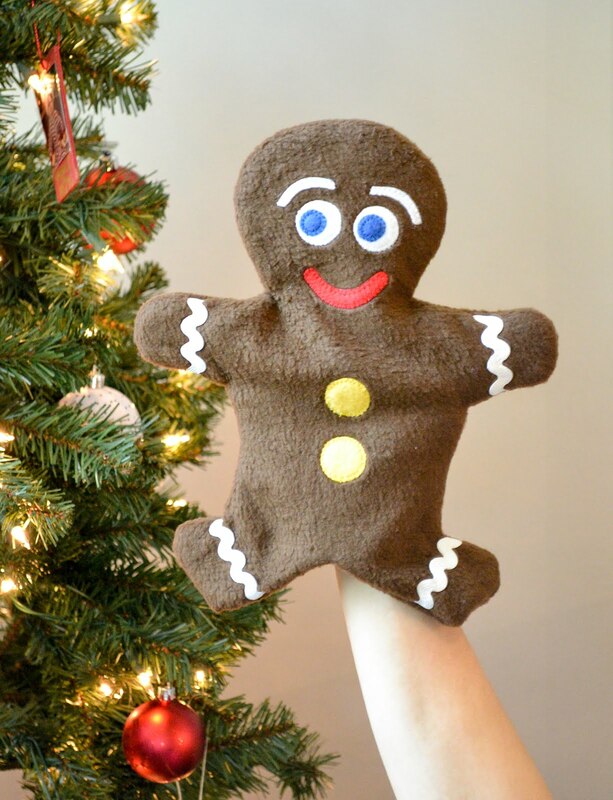 Sewing Soiree Success + a Giveaway! Our Sewing Soiree was such great fun! We had 15 gals come over for some Girls night out stitching fun. I was too busy giving instructions to take too many pictures but thankfully I got to snap a few toward the end. Everyone brought something to work on. The experienced helped the beginners. A big thanks to Caroline of Sew Can She who helped my plan it and pull the whole night off. A couple of months ago I discovered that Bonnie of Fish Sticks Design lives just a mile from my house and she came too. The only picture I got of her was of her taking a picture as we were laughing at ourselves taking pictures for our blogs. Mostly there was a lot of chit chat and fun visiting of course. About half of the gals made a version of my Simple Tote. Tutorial coming soon! We had every skill level from first time sewists to fashion designers. Check out these fabulous sleeves on Kim's dress. 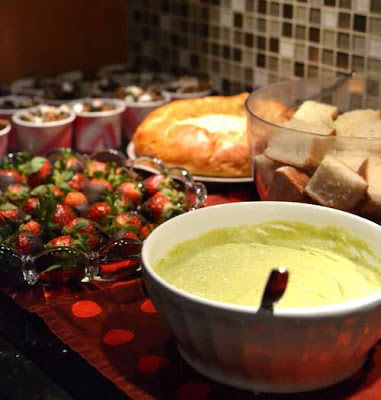 Oh we also had quite a spread of yummy food. Ninfa's Green Sauce, Chocolate Chex Mix, and Lemon Cream Cheese cupcakes, cheese dip, chocolate strawberries and a few other things brought by friends. About half way through the night we had a little door prize drawing for Chickadees made by Caroline, Patterns from Bonnie, and a set of hot pads that I made. Everyone got to take home a little goodie bag provided by Sew Can She. Thank you Caroline! And now if you are reading this and are sad you didn't get to come, I have a little prize to giveaway. Hot pads made from my sew along scraps and a SewCanShe goodie bag with a Fat Quarter a bit of ribbon, and a presser foot guide. To enter to win this fun package, leave me a comment saying what you would have liked to make that night. 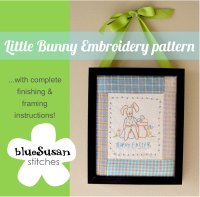 You will get an extra entry if you are a Blue Susan makes follower and an extra entry if you subscribe to the Sew Can She newsletter. Please make a note of these things in the comments too. The Giveaway will be open until Friday! Good luck! gotta say, looked like a lot of fun. I do wish I was there. I think I would have worked on a clutch purse project or a scarf. Well, someone has to first 1st and 2nd. I follow your blog and love it! Thanks for doing it. And here I am again with my third chance - I also follow Sew She Can and have downloaded many projects and found new bloggers to follow. I had so much fun! Thank you for opening up your home. I really got a good start on my baby quilt and met some really nice ladies. I would've liked to sew my daughter's Easter dresses. I'm currently re-working my twins' baby quilts from their Aunt Jo. I cut them apart, replaced the batting, cut off all the old ties where they were joined together and am machine quilting inside each block and will add binding. So I would have worked on these had I been at your get-together :). I would have been trying to get baby's diapers done. :) Thank you for a wonderful giveaway! I am currently working on a few things but would have brought my "easy street" so I can finish it up. Yes I do follow Sew Can She and have made a few things from there. Wonderful give a way. I would have got nothing done. I would have been too busy looking at what everyone was making and picking up the scraps on the floor!! I might have brought along my hexies to look busy but really I would have been talking, admiring and collecting scraps!! I follow your blog. I love reading your posts. I get the Sew Can She newsletter. It is a great resource and inspiration tool. I found my way here from the Fishsticks blog. It looks like you had a great time at the soiree. I would have loved to make one of the totes. I would make reuse grocery bag.